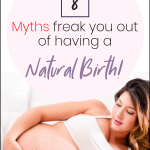 Natural Birth Tips From 40 Moms Who Have Been There and Done That! **This post may contain affiliate links. I am NOT a licensed medical professional. Always consult with a qualified healthcare professional. For my full disclosure policy click here. Planning on having a natural birth or know of someone who is? These 40 natural birth tips (from 40 experienced moms!) are just what you need. There is still an air of mystery (how do you do it?) and fear (I’m terrified of the pain!) that surrounds the topic of unmedicated childbirth. Unfortunately, it is depicted on TV and even by some healthcare professionals, as something scary that women shouldn’t put themselves through. What is and should be shown as a beautiful, empowering, supernatural, a rite of passage, is depicted and treated as somewhat of a medical emergency. Not enough patience for baby and laboring mama, and too many hands and machines. All of these seemingly “safe” interventions and yet maternal death rates keep climbing? Of course, things can happen during labor which call for the use of life-saving medical intervention, but in this day and age most pregnancies and births can be expected to end well for both mom and baby and without the use of interventions. As a doula and mom who has had 2 unmedicated births, I can tell you that I’d do it again in a heartbeat. Yes, it is challenging both mentally and physically but it is also life-changing, beautiful, and empowering! I along with these 40 mothers are here to tell you that you too can do it! Take note of these practical and encouraging natural birth tips! See a Webster certified chiropractor that will do pelvic alignments! Getting baby in the right position helps soooo much with pain management and labor duration. Be patient. Remember that the birth process is a dance between you and your baby, but you’re not always the one leading! A willingness to let your baby birth on his/her timetable lowers stress and allows your body to respond in the most physiologically natural way. (Three natural births -two were water births. I had two natural births using Hypnobabies. Whether you’re into the idea of “self hypnosis” or not, the key idea of relaxing your body as much as possible makes it so much easier. It takes effort to get yourself to relax, but it really helps ease the pain when you’re not tensed up. Preparation is key to a successful natural birth! My mom is an OBGYN who had two natural births and taking natural birth classes is her number one recommendation to anyone who wants one. Personally, I can’t say enough amazing things about Hypnobabies. I had an incredible, comfortable birthing time (Hypnobabies for “labor”) thanks to the program. I’ve had two unmedicated natural births and my biggest tip would be to take a natural childbirth class. It helps you understand what’s happening to your body which takes away the fear. A lot of women are afraid of the pain of labor, but when you know what’s happening to your body you eliminate a lot of that fear. That’s hugely helpful in managing pain during a natural birth. I didn’t realize how important my physical strength would be during my labor. I was really active my whole pregnancy (walking, yoga, running our little homestead) and that strength was vital!!! Now that I’m prepping for baby #2, I’m trying to maintain that same strength! I’ve had 3 natural, out of hospital births, and one of the biggest hurdles for me the first time around was letting go of the fear and believing I could do it. Our society does a good job of teaching us that birth is scary and something that happens to you. But what we should be telling mother’s is that our bodies are made for this and you are part of the process. Watching a ton of empowering birth videos and learning everything I could about birth really helped me let go of fear and believe in myself. Pain is usually the thing women fear most when preparing for birth. In my experience, the fear is worse than the pain though. When we go into labor the fear that the pain will get worse and unbearable sends us down a vicious cycle of tension and more fear, which causes the pain to feel worse. If you can find a way to keep your mind centered, your body relaxed and turn the fear into a positive feeling, it is a game changer! I had 2 unmedicated births and kept thinking the pain would get unbearable, but it never did. It was hard and definately exhausting, but it was also wonderful and im so glad i had the chance to experience and witness my body’s strength and power. I’d say shove that birth plan onto anyone who’s going to be there in the delivery room’s face, starting with your doctor/midwife. Make sure it’s well laid out and clearly mentions your expectations. You can try getting a perineal massage, and practice some kind of meditation. Also, don’t start pushing too early or you’ll wear yourself out. I’ve had two home births and loved them! I treasure those memories so much. After having 2 unmedicated hospital births, I’d say speak up for yourself and take charge of your birth experience. Make sure that everyone with you in that room is on the same page as you so there is no confusion and disappointment and you can focus on birthing your baby! I’ve had three unmedicated births. The biggest thing that helped me was understanding what was happening in my body. I took the Bradley Miller Method classes, which are INTENSE. It was like 9 weeks of 3 hour-long classes. Because of those really in-depth classes, I knew that the “pain” I was feeling was my uterus pulling the muscles tight to open things up for the baby to come out. So the pain was reframed in my mind as just my muscles working. Visualizing the opening of the muscles with each contraction was really helpful for me because it seemed more like a workout, instead of just this unexplained pain that kept coming. Knowing the reason for the different things that were happening in my body made them make sense for me. This, and all of the other knowledge and practice that the Bradley method focuses on, helped me feel in control of the situation. You can take much more pain than you actually think you can. I’ve had two natural births less than two years apart and they each taught me that. Think about your body connecting to the gravitational pull of the earth, getting your baby out with each contraction! I’ve given birth naturally once. It was something I started thinking about halfway through my pregnancy. I didn’t have a very detailed birthing plan. I just knew I wanted to try giving birth naturally. When it was time to give birth, I had a plan but it fell through. So I just trusted my body. Something naturally kicks in and tells you what you need to do. I remained calm and listened to my instincts and my body naturally did the work on its own. I mean I ended up delivering in a hospital so I was hooked up to a machine. The nurses were telling me not to push yet. They didn’t think I was dilated enough for my baby to come. But with every contraction, my body was pushing on its own. I couldn’t control it. My baby girl was born with my legs in a butterfly position. I did it without the drugs. So trust your instincts Mama. I envisioned myself riding waves to baby. Changing positions, humming. Always breathe. Counter pressure on lower back helped. Don’t feel shame for taking control of your birth. Remember, tensing up during contractions is working against yourself. Holding tension will make contractions more painful and last longer. It’s hard, but remember to keep relaxed and loose. Think of the contractions as a wave, it will have a slow rise, a peak, and a decline. But you must remain calm and relaxed throughout each phase to meet your baby. Due to circumstance, I was mainly in the bed the entire time laboring. I wish I would have read more about labor positions and tools to help me labor while confined to a bed. I was still able to achieve my natural birth, but I feel it was much longer and stressful than it would have been had I been more aware of tools I could use in that situation. Hire a doula! It’s such a great investment. I have hired a doula again for this pregnancy. She helped me get into the right ‘mindset’ and go inside myself during contractions rather than dwelling on the pain. I remember starting this low growling sound and after the contraction passed she asked if I growled. I was so embarrassed, so I started to shake my head no. She told me it’s totally normal and my body was telling me that it was almost time to push. My midwife checked and I was fully dilated and ready to push when I felt the need. I remembered at that moment a part from Ina May’s book that growling is completely natural and having a loose jaw while being ‘wild’ helped. I really think it did help, as I continued to growl ( totally got louder the longer I pushed) it helped me through the contractions and pushing. I felt powerful and that I could do this. As soon as I let go of the thought that this natural occurence was embarassing, it became a tool to help me work through the pain and helped me push. My Hypnobirthing book really helped me to breathe through the pain. Music and aromatherapy oils were awesome. Some hospitals offer an aromatherapy massage. Change positions or don’t as you like. And remember you can say no. I would recommend a blindfold. This may sound strange but I needed complete darkness to focus on my breathing! My husband had a bandanna in his bag so he tied that over my eyes. I labored all night but the lights on the monitors would bother me! The bandanna was such a help. One contraction at a time. You can do anything for one minute. I wish I would have trusted my body and not gotten the epidural. That thing numbed me so much that was pretty much useless. I couldn’t feel a thing at all and my pushing wasn’t efficient. My baby was here within 2 minutes after they removed my epidural. Next time I’ll avoid getting the epidural and hopefully I won’t have to spend 3 hours pushing to no avail. Your body is meant to do this. It can do it. Just let it. I watched hundreds of YouTube videos during pregnancy to figure out how I wanted to birth. During labor I kept telling myself “it’s pressure, not pain” and slept between every contraction and didn’t have any pain till I crowned. Have someone’s job be to give you sips of water after each contraction or push and keep a fresh cloth for your forehead and neck. Breathe and try not to tense up your body during a contraction! Give yourself something to focus on, like I had a song stuck in my head and I kept the same lyric in my head during each contraction. When you think the pain is so bad, just remind yourself it’s only a minute. Don’t do directed pushing but instead, push when you are ready and in the way you want. It will help you perineum stretch and work with your baby. Do anything you can to normalize the birth process. Listen to birth story podcasts, read birth story blogs, ask a friend who has had a positive birth to tell you their story. That way, when the intensity of labour hits you, you will know it is normal and you are safe. Mind over matter. Prepare your mind to accept the surges as beautiful waves bringing life into the universe and not as pain. In my opinion, visualization and meditation practices are key to a successful unmedicated natural birth. Prepare yourself mentally throughout your pregnancy (read books, watch natural births, understand the actual dangers to you and your baby medications have) and get chiropractic care if you can! I had no back pain the entire labor and pregnancy and I think that is why. Movement! The ball they offer you to sit on helps you manage the pain so well! Don’t just lay in the bed get up and move around. Deep breaths are important. They keep you from going crazy. And honestly, the environment plays a big role as well. Setting the right atmosphere is key! 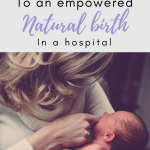 I was lucky enough to have a natural birth in a birthing suite and I ABSOLUTELY loved it. I had my favorite music playing on my Bluetooth speaker, the lights were dim, I had my diffuser going as well with lavender essential oil. I had my baby’s grandma feeding me ice chips and giving me cold towels for my head and neck. I had a doula that never left my side. She was constantly reassuring and motivating me. I only had the people in there that I wanted and the atmosphere was very soothing. I started out in my birthing tub, because I wanted a water birth but ending up pushing on the bed. After giving birth, my baby didn’t leave my sight. They had everything they needed in the room. Loved my stay in the birthing suite. And I loved having a natural birth in general. #35: If you need something, ask! Don’t be afraid to ask for what you want during labor. Whether it’s silence, no lights, more ice, etc…If you need it, ask! Also Don’t try to fight the contractions embrace them. Learn breathing techniques! I only had a 4 hour labor! I’ve always underestimated the power of breathing but it really does work. I’m only 20 years old and I do not take pain very well. I don’t even have a tattoo due to my fear of needles. I didn’t plan on having a natural birth but he was ready to come. I went from 1cm to 8cm dilated in 45 minutes. Contractions were the most painful for me pushing was a breeze. Just breathe and things will be good! Have a solid support system. I told my boyfriend practically every day that I didn’t want an epidural and he questioned it so I was worried but when the big event came I was practically begging him to not judge me if I get one. He told me to just try to make it a little longer. I was very proud of him! Give in to your contractions, do not fight them. Remember to breathe, find a focal point and focus. Once you hit the “ring of fire”, it’s almost over. Push through that burn. Be sure to check in with yourself, understand the difference between feeling pain and true suffering. If you feel pain, know that you are not in danger and it will not last forever. If you feel that you are truly suffering- try a position change, try to calm yourself, and/or voice it to your support person. Birth is 90% mental and 10% physical. Get your mind right! Remove and fears or doubts you may have and don’t be afraid…And the pain is not as bad as people make it seem! 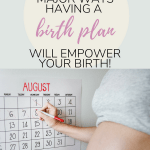 I really hope that you found these natural birth tips to be helpful! Feel free to drop me a line at heymallaury@lifeofababe.com or via Instagram. Fill out the form below to join my EXCLUSIVE email list. By signing up, you’ll receive helpful tips, and get notified every time a new blog post goes up. Subscribe now so you don’t miss out! Which one of these natural birth tips reasonate with you? This is a good post. I had a birth plan but it didn’t go as planned. All four of my kids I ended up needing a c-section. If that happens do not beat yourself up. All that matters in the end is that you and baby are healthy. 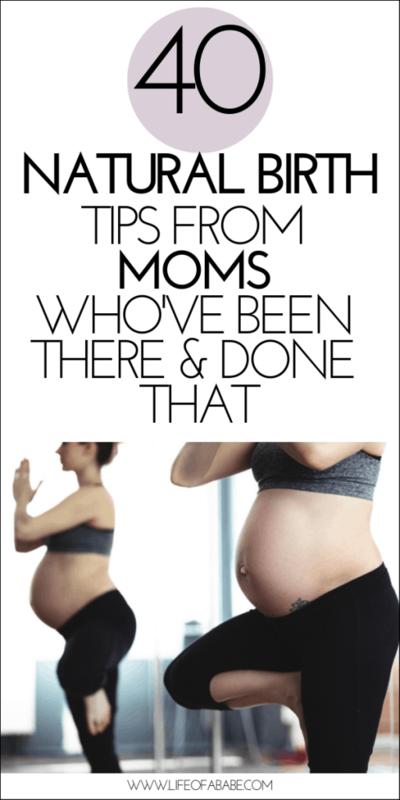 These tips are so helpful for moms who plan to deliver naturally. Having a support system (birthing team, partner or doula) is so beneficial! These are amazing tips! I was honestly too nervous to try, but these tips would have been really helpful!